The odds are stacked well against Scotland ahead of today’s quarter-final clash with Australia at Twickenham. It was always going to be a tough ask, but the suspension of Ross Ford and Jonny Gray earlier in the week, arguably Vern Cotter’s two most vital players, left them with a mountain to climb. The duo have since had their bans overturned but Cotter has yet to decide, hours before kick off, whether either will feature. Scotland’s stellar back row of brothers for now has been broken with Richie Gray not linking up with his brother Jonny. Tim Swinson steps up to plug the gap. 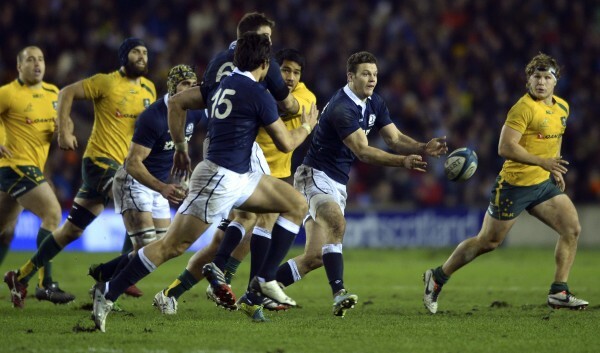 In the front row, Ford has been replaced by Glasgow’s Fraser Brown. In the other camp, Australia remain unbeaten in this year’s World Cup and will be ‘big game’ ready after a pair of hardening clashes against England and Wales. Those two steely triumphs have led former Scottish captain Rory Lawson to claim that this could be the best Australian side ever. The pack combination of David Pocock and Michael Hooper has proven to be a major success for the Wallabies, having starved a number of classy sides of possession over the last few weeks, all arguably better sides than Scotland who were wooden spoon ‘winners’ in the most recent Six Nations. It suggests a big win could be in prospect for the Aussies. Genia has shown flashes of brilliance so far in the world cup and it’s up to Laidlaw to extinguish any spark from the 27-year-old, who is set to play for Stade Francais on his return from international duty this season. during the 2015 Rugby World Cup Pool B match between Samoa and Scotland at St James’ Park on October 10, 2015 in Newcastle upon Tyne, United Kingdom. Greig Laidlaw is Scotland’s captain, goal kicker and a very much in-form attacking star. The half back has been producing fine performances week in, week out and has been a crucial cog in the plucky but successful Scotland machine. If Scotland are to pick up a win, his performance will have to be 10/10, but the Gloucester man has all the tools to pull it off. His goalkicking battle with Barnard Foley should prove to be tight and probably crucial, but an enthralling battle looks in prospect as he and fellow silky number nine Will Genia come head to head. While Australia have found a number of different ways of grinding out results, Scotland have often been accused of lacking ideas in attacking areas. The last of the quarter finals does look to be the most one sided of them all, but, perhaps crucially, Scotland have won two of the last three matches between these two sides. Though the under strength Scots have it all to do, that psychological edge and a ‘backs to the wall’ mentality could bring about one of the biggest shocks in World Cup history. Australia: 15 Kurtley Beale; 14 Adam Ashley-Cooper, 13 Tevita Kuridrani, 12 Matt Giteau, 11 Drew Mitchell; 10 Bernard Foley, 9 Will Genia; 1 Scott Sio, 2 Stephen Moore, 3 Sekope Kepu, 4 Kane Douglas, 5 Rob Simmons, 6 Scott Fardy, 7 Michael Hooper, 8 Ben McCalma. Replacements: 16 Tatafu Polota-Nau, 17 James Slipper, 18 Greg Holmes, 19 Dean Mumm, 20 Sean McMahon, 21 Nick Phipps, 22 Matt Toomua, 23 Quade Cooper. Scotland: 15 Stuart Hogg; 14 Sean Maitland, 13 Mark Bennett, 12 Peter Horne 11 Tommy Seymour; 10 Finn Russell, 9 Greig Laidlaw (c); 1 Alasdair Dickinson, 2 Fraser Brown, 3 Willem Nel, 4 Tim Swinson, 5 Richie Gray, 6 Blair Cowan, 7 John Hardie, 8 David Denton. Replacements: 16 Kevin Bryce, 17 Gordon Reid, 18 Jon Welsh, 19 Alasdair Strokosch, 20 Josh Strauss, 21 Henry Pyrgos, 22 Richie Vernon, 23 Sean Lamont.